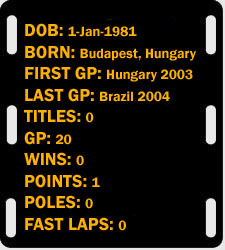 On 24 August 2003 a history was made at the Hungaroring circuit. We don't refer to the fact that Renault driver Fernando Alonso became the youngest driver to win a Formula One Grand Prix, but that Zsolt Baumgartner became the first Hungarian to participate in a round of the Formula One World Championship. Much like the understudy that gets their big break due to one of the lead actors suffering some kind of misfortune, Zsolt made his F1 race debut as a result of Ralph Firman's high-speed practice crash during Saturday practice. With the Anglo-Irish driver ruled out for the remainder of the weekend Zsolt was given his superlicence - following a hurried meeting between Bernie Ecclestone and the team bosses - and promptly qualified nineteenth. Sadly his debut race only lasted 34 laps before his engine spectacularly blew on the main straight. Two weeks later the Hungarian again replaced the recuperating Firman, this time finishing eleventh at Monza in the Italian Grand Prix. As is so often the case, Zsolt's career began in karting, in 1994 and 1995 he was runner-up in the Hungarian Junior A Championship. In 1997 he switched to single-seaters and finished a credible third in the German Formula Renault series, while the following year he was third in class at the highly respected La Filiere (Prost) School. In 1999 he contested both the German and European Formula Renault 2000 Championship, taking the German and finishing third in the European series. In 2000 and 2001 he contested the German F3 series with mixed results before switching to F3000 for the last four rounds of the 2001 championship with the Prost Junior team. In 2002 he remained in F3000 but was now with the team that had taken Justin Wilson to the title the previous year, Nordic. Sadly Nordic was in decline and Zsolt's best result was a sixth. That said the youngster got to run three laps in front of his countrymen when Jordan arranged for him to complete a three-lap demonstration run before the 2002 Hungarian GP. 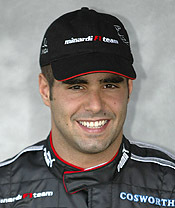 For 2003 Zsolt signed to drive for Coloni Motorsport in F3000 while it was also agreed he would drive the Jordan at a couple of the Friday morning pre-GP test sessions. Following a 50km shakedown at Silverstone in July he took part in the Friday test session at the German GP and three weeks later he made his historic F1 race debut at the Hungaroring. Although he certainly didn't let himself down few believed he would ever be seen racing in anger in a Grand Prix again. A week later the deal was done, courtesy of an injection of cash from the Hungarian government, and therefore Zsolt will line-up alongside Gianmaria Bruni in 2004. There are many who believe the drive should have gone to Justin Wilson, though there are a number of other hopefuls who deserved the opportunity. Stoddart believes Baumgartner could be the latest in a long line of Minardi discoveries, a list that includes Webber, Alonso, Fisichella, Trulli and Gene. Whether the Hungarian is another rising star or just another pay-driver remains to be seen.